Liven up your party with our awesome line of custom balloons - we have a huge variety of balloons that are environmentally friendly and 100% biodegradeable. So party away guilt free, let your hair loose, and have fun! We have regular helium quality latex balloons (which are all 100% biodegradable), latex heart shaped ones (perfect for Valentine's Day), globe or Earth balloons, and Cloudbusters (also known as cholroprene balloons), which do no allow for any imprinting, but are mostly used as great markers or attention grabbers at any tradeshows or events. The most popular ones are of course, the regular custom latex balloons, which come in the following sizes: 9", 11", 14", and 18". What this means is, if you order a 9" balloon for example, you can inflate it so that it is approx 9" (often a little larger even) tall. Can I Print Photographs on Latex Balloons? Lots of our customers often ask if we can print photographs onto balloons, and the answer is yes. However, it comes with some caveats: your photos will be silk screen printed onto the balloons. This means we lay down ink or paint, and to replicate the gradients/shadings in photographs, we have to silk screen them in a dotted pattern - almost like a newspaper print. It may be best to visualize this by referring to our half-tone printing page, where you can see clear illustrations of how photos are screen-printed onto balloons. Another trick to printing photos, particularly portraits of people onto custom balloons is to do it the "Andy Worhol way" (as we like to call it!). You can see an example of one of his works here of Chairman Mao Zedong. This eliminates the dotted, half-tone printing method, which some people may not like. Furthermore, it gives your photos a nice creative artsy look! Who doesn't want that! Can I Print Multicolor or Full Color Artwork on Logo Balloons? 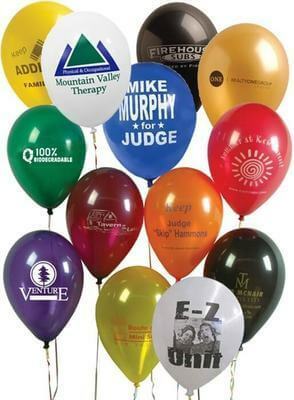 Another often fielded question we often get is if we can print more than 1 ink color onto our logo balloons. The answer is again yes, but again, with some caveats. To print more than one ink color, we have to first inflate the balloons, put it into the press, and put that same balloon under a second screen to print the second color. Due to this screen printing process, perfect alignment or perfect registration between the ink colors is not possible, and could sometimes result in up to 1/8" mis-registration between the ink colors in any direction for the personalized balloons. You can again get better visualization of what mis-registrations for multicolor printing may possibly look like by clicking here. For this reason and also for reasons of cost, 99% of our customers choose to print balloons in just 1 color print, and they are always 100% happy with the end results, and most importantly, they always have successful and festive events full of cheer! We would love to work with you! Feel free to contact us anytime you have any questions, and we will always do our best to make sure your event or party is full of fun and good festive energy with our brightly colored balloons.